In the rush of retailers opening their doors for big sales on Thanksgiving Day, the idea of devoted Black Friday shoppers so determined to score deals that they’ll line up hours ahead of time might seem like it’s a thing of the past. Not so, as two friends who have been camped out at their local Best Buy for a week already in order to get the best possible spot in line when the time comes. 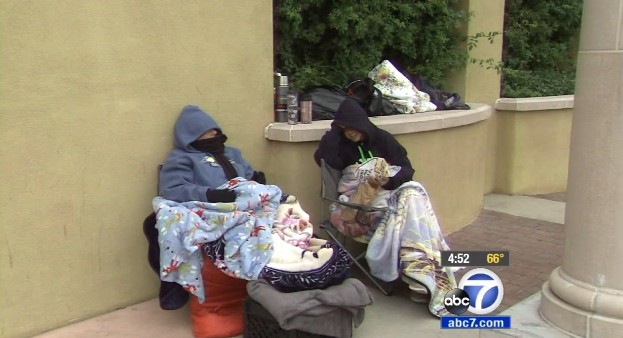 More than two weeks before the store’s doors open on Black Friday, the two best friends have set up a camp stocked with warm clothing, food and hot coffee, reports ABC 7 in Los Angeles. It’s a two-person effort that splits up the overnight stays at the store between the two, with each one taking a turn sleeping their and saving the other’s spot. If both women have to be gone, one of their husbands steps in. “The point is to get the sales, because everybody is on a fixed income and we don’t have that kind of money to splurge,” one woman’s spouse explained. As for what visions are dancing through their heads on this campout, both are hoping to score a 50-inch HD TV for $199. In the meantime, they’re chatting to plenty of people during their long wait. Some call them dedicated, they explain, others say they’re being stupid. But it’s all about keeping their eyes on the prize. “They say they’re crazy, but then they come and ask us can you save a spot in line, or can you do this for us? We’re not here for that. We’re just here to get our stuff and that’s it,” the husband added.